As our economy, society, and daily life become increasingly dependent on data, new college graduates entering the workforce need to have the skills to analyze data effectively. At the request of the National Science Foundation, the National Academies of Sciences, Engineering, and Medicine organized a study to explore what data science skills are essential for undergraduates and how academic institutions should structure their data science education programs. We invite you to join us for a report release webinar on May 2, 2018 at 11am ET. During this webinar, study co-chairs Laura Haas and Alfred Hero will discuss the report’s findings and recommendations, followed by a question and answer session with webinar participants. Learn more about the study, download the interim and final reports, and watch past webinars on the study webpage at nas.edu/EnvisioningDS. The summary paper and videos are now available from the inaugural Big Data and Finance conference held at the University of Michigan. The panels included a session on data modeling and analytics led by Prof. HV Jagadish (EECS), and another on data privacy and security led by Prof. Alfred Hero (MIDAS co-director). From left, Al Hero, U-M; Patrick Wolfe, UCL; and Brian Athey, U-M signed an agreement for research and educational cooperation between the University of Michigan and University College London. ANN ARBOR, MI and LONDON — The Michigan Institute of Data Science (MIDAS) at the University of Michigan and the Centre for Data Science and Big Data Institute at UCL (University College London) have signed a five-year agreement of scientific and academic cooperation. The agreement sets the stage for collaborative research projects between faculty of both institutions; student exchange opportunities; and visiting scholar arrangements, among other potential partnerships. Alfred Hero, co-director of MIDAS and professor of Electrical Engineering and Computer Science at U-M, said that one of the original goals of the institute when it was founded in 2015 under U-M’s $100 million Data Science Initiative was to reach out to U.S. and international partners. 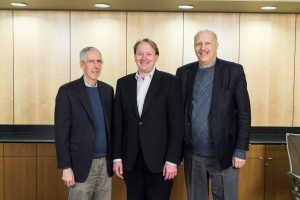 Wolfe visited Ann Arbor in early January to sign a memorandum of understanding along with Hero and Brian Athey, professor of bioinformatics and the other MIDAS co-director. exchange of visiting research scholars. Al Hero, Co-Director for the Michigan Institute for Data Science (MIDAS), has received the 2016-2017 Stephen S. Attwood Award, the highest honor awarded to a faculty member by the College of Engineering for “extraordinary achievement in teaching, research, service, and other activities that have brought distinction to the College and University.” More information on this prestigious honor are at http://eecs.umich.edu/eecs/about/articles/2017/al-hero-receives-coe-stephen-attwood-award.html. This symposium will bring together leaders from the public and private sectors and academia to meet the challenges posed by deployment of transformational transportation technologies. MIDAS affiliated faculty members Carol Flannagan, Al Hero and Pascal Van Hentenryck will be speaking. A recent analysis of Supreme Court data by U-M LSA Dean Andrew Martin, published in FiveThirtyEight, shows that the late Antonin Scalia was almost never the most conservative justice on the court. Recently it has been shown that many published results in biology, epidemiology, psychology have failed to reproduce when reanalyzed with new data. This article in Slate argues that the reproducibility crisis is actually good for science, creating an awareness of the need for careful experimental design and and statistical data analysis. MIDAS is committed to promoting reproducible research practices.